Jacqueline Hritzo, trumpet, is a junior at Our Lady of Good Counsel High School. 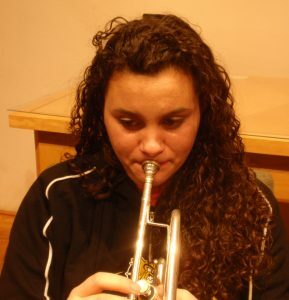 She has played trumpet for 11 years and enjoys practicing and rehearsing. Jacqueline is so grateful and blessed to be a member of Brass of Peace, where she receives amazing direction and guidance, is provided the opportunity to play epic brass music, and honored to play with talented and musical colleagues. When Jacqueline is not playing trumpet, she enjoys listening to classical music, especially Canadian Brass, Bach, Beethoven, and Wagner to name a few of her favorites, reading scores from IMSLP, doing homework, or cheering on her favorite sports teams. Aislin Carpenter is a junior at Westfield High School. After starting piano lessons on a whim in the first grade, she became obsessed with the musical universe. 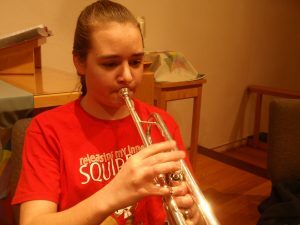 Since then, she has fallen in love with the trumpet and has been playing for six years. While this is Aislin’s first season with Brass of Peace, she feels honored to be included among such talented musicians and accomplished mentors. She enjoys the constant exposure to new brass ensemble music, as well as the individualized coaching. In her free time, Aislin likes to compose, write poetry, and make egregiously bad puns. Overall, she is excited to perform in Carnegie Hall with such a “sharp” group! Forrest Johnston, Section Leader is a junior at Langley High School in Mclean, Virginia. 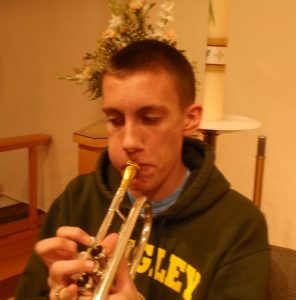 He began studying the trumpet with his dad when he was six years old. Over the past ten years, Forrest has enjoyed playing in a variety of settings, ranging from large wind ensembles and symphony orchestras to small chamber groups. Forrest was the principal trumpet of the All-Virginia Orchestra in 2016 and 2017. Forrest also enjoys performing as a soloist and has participated in numerous competitions over the years. He is a four-time winner of the National Trumpet Competition and the International Trumpet Guild’s Youth Solo Competition, including winning the high school divisions of both in 2017 and 2018. Forrest currently plays in the American Youth Philharmonic, the Langley Wind Symphony and the Langley Jazz Band. In addition to his musical interests, Forrest is an avid member of his school’s cross country and track teams. Forrest’s favorite thing about Brass of Peace is discovering and playing new music with the other dedicated members of Brass of Peace every week. Gabrielle Pho, Section Leader is proud to be in her fourth year with Brass of Peace. Gaby is a senior at Annandale High School and studies with NSO hornist James Nickel. She is also a member of the NSO Youth Fellowship Program and the American Youth Philharmonic. She has performed with the Virginia District X Honor Band, Northern Virginia Senior Regional Orchestra, and All-Virginia Orchestra. For the past three summers, she attended Kinhaven Music School in Weston, Vermont. Through Brass of Peace she has made lasting friendships, gained valuable performance experience, grown under Sylvia Alimena’s mentorship, and loved every second of making music with some extraordinary musicians. Graham Lovely is a junior at Dematha Catholic High School in Hyattsville MD. His parents, both professional musicians, exposed him to music at a young age, through the choir and piano lessons. However, it really was in listening to the symphonies of Tchaikovsky and Mahler that his deep love for music began to develop. In particular, it was the unique sound of the horn that inspired him to begin a journey of playing the instrument in the fourth grade. Seven years later, he is still continuing that journey: now as a National Symphony Orchestra youth fellow and a member of the American Youth Philharmonic horn section. 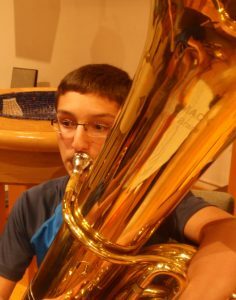 In addition, he plays in his school’s Wind Ensemble and has been a member of Maryland all-state ensembles for the past 3 years. Graham is in his second season with Brass of Peace and enjoys every second of it. The individual and collective talent of the group, Ms. Alimena’s invaluable coaching and the sheer awesomeness of brass music all come together to create an unparalleled musical experience for which Graham is extremely grateful. “Everyone steps up to the plate and goes the extra mile for the group. That collective effort pushes everyone to take their playing to the next level.” He is very excited and humbled to play on the hallowed stage of Carnegie Hall. When he isn’t practicing you can find him playing his favorite sport, Ice Hockey, cheering on the Washington Capitals, studying for AP US History or spending time with his golden retriever, Chelsea. 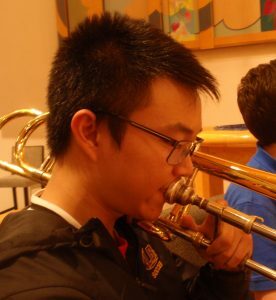 Eugene Song is a senior at Lake Braddock High School and has played the trombone since 5th grade. He also loves to listen to jazz, hip-hop, and bluegrass. Eugene has been exposed to music since his childhood by his parents, Gregory and Phidese. His little brother, Raphael, is starting to play bassoon. Eugene is the biggest Baltimore Ravens football fan as well. Brass of Peace to Eugene has been a privilege to be able to surround himself with amazing musicians that continue to epiphanize his view on music. He thanks his family, friends, mentors and teachers for giving him the opportunity to enjoy, learn, and play music. Liam Barron is a sophomore at Briar Woods High School in Ashburn, Virginia. 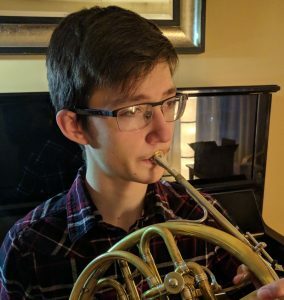 He began playing tenor trombone in fourth grade but quickly fell in love with the dark sound of the bass trombone which he began playing in the eighth grade. He is currently the bass trombone for the American Youth Philharmonic and the National Jazz Workshop’s All-Star Jazz Orchestra. 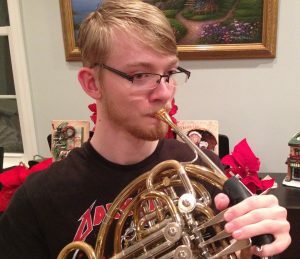 In addition, he plays with several groups at his high school. For the past two years, he was the principal bass trombone in the Northern Virginia Senior Regional Orchestra and the All Virginia Jazz Ensemble. He also was the principal bass trombone for the All Virginia Orchestra last year. When he isn’t belting out pedal tones until he gets lightheaded, he enjoys designing and creating objects with 3-D printers. This is Liam’s second year playing bass trombone in Brass of Peace. He finds it refreshing to work with such high caliber musicians that truly care about the music. He is very excited to have the opportunity to play at Carnegie Hall – a stage that regularly hosts the world’s greatest musicians. Diego Stine, 16, has been a member of the National Symphony Orchestra’s Youth Fellowship Program since 2013. Through the Fellowship, he has performed on the Kennedy Center’s Millennium Stage as a solo and chamber performer and on the Kennedy Center Concert Hall with the NSO in their Halloween Spooktacular Family Concert. He is the current tubist of the American Youth Philharmonic Orchestra and Brass of Peace, both under the direction of Sylvia Alimena. This past summer, he played in Carnegie Hall with the National Youth Orchestra 2 and bassist/vocalist Esperanza Spalding, under the direction of Giancarlo Guerrero. He is an active member in George C. Marshall’s High School Concert, Jazz, and Marching Bands. 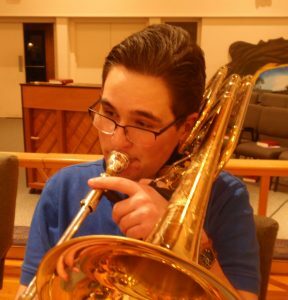 He has achieved first-chair in the state of VA as a freshman on tuba, and second-chair bass trombone as a sophomore. 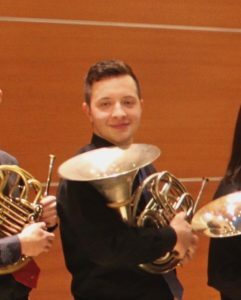 Diego Stine currently studies with David Fedderly, retired tubist of the Baltimore Symphony Orchestra, and Steve Dumaine, tubist with the National Symphony Orchestra. I greatly enjoy Brass of Peace because the music we play is complex and powerful, and all the players can rise to it. We come together extremely well at every rehearsal. Everyone who is there wants to be there, and we do whatever is possible to make things happen. The result is a great musical experience for everyone. Sylvia Alimena, Music Director and Conductor, has had an active 29-year conducting career throughout the Washington, D.C. Metropolitan area. Summoned to Washington in 1985 as Second Hornist of the National Symphony Orchestra by Mstislav Rostropovich, Ms. Alimena held that post for 29 years until her retirement in 2014. During her tenure with National Symphony Orchestra, Ms. Alimena served as the NSO Summer Music Institute Assistant Conductor, NSO Youth Fellowship Program coach, NSO Youth Fellowship Program private horn instructor and lecturer. She has conducted clinics and master classes throughout the country and including at the prestigious Juilliard School and Curtis Institute of Music. In 1992, Ms. Alimena and twenty-one of her NSO colleagues formed the critically acclaimed Eclipse Chamber Orchestra which explored works not found in the NSO repertoire and featured its members as concerto soloists. Over the course of her 20-year tenure with Eclipse, the orchestra commissioned almost a dozen new works and presented world premieres for nearly twenty. The Eclipse/Alimena discography includes Overtures of Florian Gassmann on the Naxos label, Late Victorians/Music of Mark Adamo on the Naxos label, and the Toch Cello Concerto with cellist, Steve Honigberg on the Alba label. 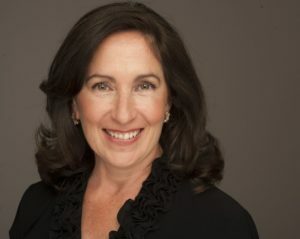 Ms. Alimena served as Music Director of the McLean Orchestra (2003-2010), the Friday Morning Music Club Orchestra now know as Avanti Orchestra (1995-2004) and as Music Director ad interim for the American Youth Philharmonic Orchestras and the Principal Conductor ad interim of the AYP Orchestra (2017-2018). From 2003-2006, Ms. Alimena formed a collaboration with soprano, Evelyn Lear and bass, Thomas Stewart to produce the first orchestral performances for the Evelyn Lear and Thomas Stewart Emerging Artist’s Program, focusing on the music of Wagner. Ms. Alimena is in her 29th season as Music Director of Brass of Peace, a scholarship brass ensemble dedicated to creating an environment of higher musical learning for the Washington area’s most accomplished high school brass players. Alumni of Brass of Peace hold principal chairs in orchestras, bands and brass ensembles throughout the world. In 1994 and in partnership with the National Symphony Orchestra Education Department, Brass of Peace initiated bi annual in-school Kidshare Concerts for children in the District of Columbia, Arlington and Alexandria. Each year, over 1000 children are exposed to the joys of classical music and positive role models in their schools through this initiative. A 1982 graduate of Boston University, her professional career was launched in 1980 as a member of the Boston Ballet Orchestra, the Beacon Brass Quintet, and as Principal Horn of the Boston Lyric Opera. Her horn playing was critically acclaimed for solo and offstage playing in the Boston Lyric Opera’s 1983 New York and Boston productions of Wagner’s Das Ring Des Nibelungen. In November of that year, the Beacon Brass Quintet made its Carnegie Hall debut as the only brass quintet ever to have won the coveted Concert Artists Guild Award. She later held the post of Principal Horn of the New Hampshire Symphony Orchestra. After two seasons as a member of the Boston Pops Esplanade Orchestra, under the baton of John Williams, Ms. Alimena was invited by Music Director, Joseph Silverstein to become a member of the Utah Symphony for the 1984-85 season, eventually winning the position of 4th horn. 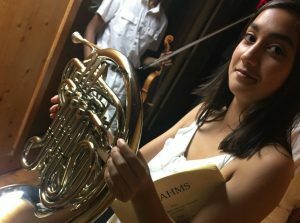 A native of Long Island, New York, Ms. Alimena considers herself the product of an excellent public school system and excellent youth orchestra programs. She began playing the french horn in the Hicksville Public Schools at age nine. Her first private lessons were at age fifteen when she was awarded a full scholarship to study privately with Arthur E. Goldstein through the generosity of the Junior Orchestra of Long Island under the baton of Eugene Kahn. In her three years as a member of the Long Island Youth Orchestra under the baton of Martin Dreiwitz, she was not only exposed to fine orchestral repertoire but traveled extensively throughout Europe, Southeast Asia, New Zealand and Australia. She continued her musical studies at Boston University and was a pupil of Harry Shapiro. Ms. Alimena is the recipient of a Boston University Distinguished Alumni Award (2004) and was voted into Washingtonian Magazine’s Musical Hall of Fame (2003). Her hobbies include gardening, hiking, world travel, home renovation and golf.